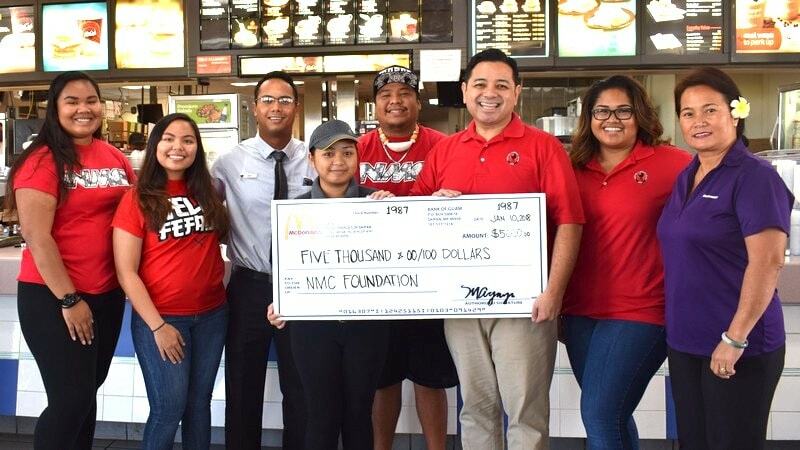 NORTHERN Marianas College on Tuesday received a $5,000 donation from McDonald�s which has been supporting NMC for five years now. Joe Ayuyu Jr., McDonald�s Middle Road general manager, said they are happy to assist the one and only college on Saipan. �We believe in the efforts of the college,� he said. �We really value education and we want what�s best for the local community.� �McDonald�s has been a strong supporter of Northern Marianas College and has contributed to the success of not only our past fundraising golf tournaments, but also student activities like the Charter Day celebration and other events,� said NMC President Dr. Carmen Fernandez. �We are grateful for the generosity of the company and of the Ayuyu family for their commitment to the success of NMC and other community organizations,� she added. According to Fernandez, the Ayuyu family was among the first people who extended help to NMC when Typhoon Soudelor damaged its buildings. �The Ayuyu family and McDonald�s helped the college tremendously by providing office space for NMC-CREES staff while repair and renovation work was underway,� Fernandez said.